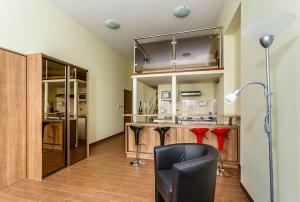 Apartments Jele offers one-bedroom apartments located in Malinska. The accommodations feature a large, furnished terrace with outdoor furniture and a spacious lawn with flowers is at the guests' disposal. Free Wi-Fi access is available. With a view of the garden, the air-conditioned apartments will provide you with a TV. Featuring a shower, private bathroom also comes with a bidet. You can enjoy garden view from the room. There is an equipped kitchen with an oven and a refrigerator. Bars, restaurants and grocers can be found within a walking distance. The property is 400 metres from Malinska Bus Station and 700 metres from Malin Beach. The property offers free parking. Pula Airport is located 54 km from the property. When would you like to stay at Apartments Jele ? This apartment has a kitchenware, tile/marble floor and stovetop. This apartment features a kitchenware, electric kettle and stovetop. Please inform Apartments Jele in advance of your expected arrival time. You can use the Special Requests box when booking, or contact the property directly with the contact details provided in your confirmation. Each day we'll check prices and send you an email for your selected dates at Apartments Jele. If you don't have specific dates but would like to check prices for say next weekend or say next month we can check the price too. Click to write a review and share your experience of Apartments Jele with other travellers.